Siguenza is in the region of Castile northeast of Madrid, and has been declared a Historic-Artistic site with many of its streets filled with beautiful civil buildings and churches. One of the main features of the town is the castle which was built in the 5th century. It was strengthened later by Arabs during their occupation and much of its protective walls have been well preserved over the centuries. In 1123 the castle was recaptured by the Spanish and converted into a Bishop's Palace. 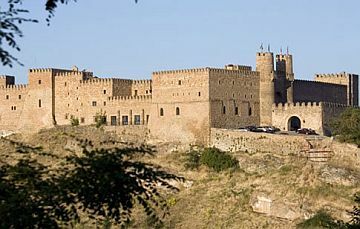 Today it is a luxury four star hotel, the Parador Hotel Siguenza. The hotel is furnished throughout with Castilian furniture, and the original dining room is now the main lounge area. 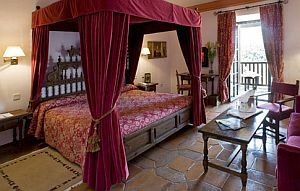 In keeping with this magnificent building some of the bedrooms have four poster beds, and because of its high position looking over the town there are also marvellous views of the roof tops of Siguenza. The Parador also has its own restaurant serving international cuisine. Siguenza's cathedral was built in the early 12th century on the instructions of Bishop Bernardo de Agen, and its construction carried on well into the 16th century. It too has the look of a medieval fortress and is of Romanesque origin with gothic elements. The ceilings and vitrals were damaged during the Spanish Civil War but have since been restored. Inside you can appreciate the full effect of the rose window as well as one of its most important features, a very significant painting by El Greco. This is also the final resting place for one of the town's nobleman, Martin Vazquez de Arce. Vazquez died in the late 15th century during a battle in Granada, and his sepulchre is displayed in the Chapel of St Catherine. There is also an impressive statue of him which was commissioned by Queen Isabella. If you are interested in religious art, the Museo Diocesano is located in a handsome neoclassical palace and contains a fine collection that dates from the 12th to the 20th century. There are also paintings by famous Spanish artists, artefacts made of gold, various sculptures, manuscripts and much more. The main vocal point of the town is the Plaza Mayor where City Hall is located, and many of the houses are decorated with attractive balconies and galleries. Another interesting site to visit is the College of San Antonio de Grande which was formerly a university founded in the late 15th century. Depending on what time of the year you choose to go, there are always wonderful festivals taking place throughout Spain and Siguenza's begin in January when they hold the Festival of San Vicente. Not far from Siguenza is the town of Atienza where they celebrate the Festival of Horses called 'Caballada' every Pentecost Sunday. Also Hita holds a Medieval Festival during the first weekend of July. Finally, between Siguenza and Atienza are the Roman Salt Mines of Imon. Salt was of crucial importance back then and became an important trading commodity with explorers. The Romans were exceptional builders of such mines, so do make a point of going to visit the mines during your stay in Siguenza.